Keep hydraulic fluids cool. (The bulk oil temperature at the exterior of the reservoir should never exceed 60°C). 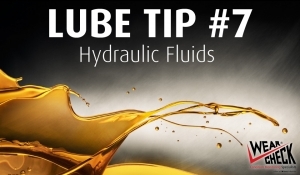 Keep hydraulic fluids clean. (There is general agreement among hydraulic experts that 75 - 80 per cent of hydraulic failures are caused by fluid contaminated with dirt, wear particles and other foreign material. In today's high-pressure systems, clearances between wear surfaces are very small, making contamination control critical). 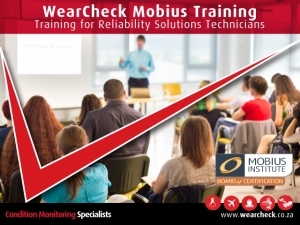 As the certified Mobius training centre for the entire African continent, WearCheck runs Mobius courses on request from customers, on-site at the customer’s premises, anywhere in Africa (apart from SA, DRC and Kenya). The full Mobius course includes compulsory six month practical training sessions. Participants are guided by WearCheck expertise that has been gained through the successful implementation of condition monitoring programmes tailored to meet the specific needs of operating, engineering and maintenance departments across a range of industries. Through these practical sessions, the skills of the technicians are developed in order to progress to the next level. The Mobius Institute is a worldwide provider of education in reliability improvement, condition monitoring and precision maintenance, to industrial plant managers, reliability engineers and condition monitoring technicians. The Mobius Institute Board of Certification (MIBoC) is ISO/IEC 17024 and ISO 18436 accredited, providing globally-recognised certification to category I-IV vibration analysts in accordance with ISO 18436-1 and 18436-2. Mobius courses are run by WearCheck anywhere, any date, on demand. *prices exclude VAT, and are valid until the end of 2018. Note: a minimum of six candidates is required for all training courses. There may be an additional charge for the lecturer’s accommodation and travel. 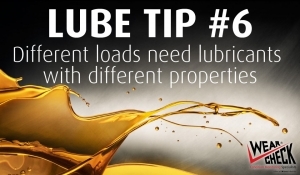 There are different degrees of severity under which boundary lubrication conditions prevail. Some are only moderate, while others are extreme. Boundary conditions are met by a variety of special lubricants with properties corresponding to the severity of the particular application. These properties are derived from various additives contained in the oil — some singly and some in combination with other additives. Their effect is to increase the load-carrying ability of the oil. Where loads are only mildly severe, an additive of the class known as oiliness agents or film-strength additives is applicable. Worm-gear and pneumatic-tool lubricants are often fortified with these types of agents. Where loads are moderately severe, anti-wear agents or mild EP additives are used. These additives are particularly desirable in hydraulic oils and engine oils. For more heavily loaded parts, a more potent class of additives is required. These are called extreme pressure (EP) agents.